Ramon Gallegos has developed holistic education in Mexico and all over the world as a response to current crisis from environmental degradation to mecanicist education which has trained human beings with a predatory consciousness. The Fundacion seeks emerge of a new planetary conscousness through a new educational paradigm of wholeness nature, that allows to teach human beings capable to live together in a responsible way in sustainability communities. To overcome predatory consciousness based on greed, materialism, and self-centered, the Fundacion points out what important is to know our truly nature as human beings, the core of holistic education is our genuine spirituality -understanding it in a no dogmatic way, spirituality is our truly nature which lead us to have a sentiment of gratitude for life and reverence for our planet in which we live. Holistic education is a pedagogy of universal love to all beings. 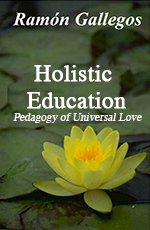 Holistic education aims to instill human beings with a global conscience and a vision of love and intelligence. This book provides a creative exploration of the emergent holistic vision, which brings together the various areas and disciplines of human knowledge, expression, and contemplation. It lays out principles of holistic education simply and clearly, explaining its core tenets, key concepts, and points of departure from the old mechanistic educational paradigm. Over the past nine years the Fundación has been spreading the educational pioneer work of Dr. Ramon Gallegos developing different programs and activities. Every year is organized the “International Conference on Holistic Education” attended by approximately 300 educators from 15 countries, its duration is of five days and this year it will be celebrated the ninth edition. Also, it has an important program of training holistic educators which include seven months courses, and a two years Master Degree -actually formed by 42 students, they both are unique and pioneer in Latin America and are offered annually in January. Publishing is another important program at Fundacion it has been published nine books of Dr. Ramon Gallegos on holistic education and one more will appear on next year, these books has been an important way of communication of holistic education. Important events are also organized in collaboration with public and private organisms as Mexican as from another countries such as gatherings, colloquiums, advisement, exchanges, etc. Around 100 speakers among educators, scientific, writers, philosophers, mystics, etc, from East, Europe, North America, and Latin America have participated in our activities and have kept a creative dialogue with our learning community shaped by around 2,000 people from Mexico and other 20 countries. We invite you to participate in our activities in order to encourage holistic education and celebrate together the awaken of our genuine spirituality! Holistic education is a thoughtful response to the ecological, cultural, and moral challenges of our age. It aims to inspire young people to live wisely and responsibly in a sustainable and compassionate society, and to contribute to the building of such a society. Dr. Ramon Gallegos Nava is a young Mexican sociologist who has introduced hundreds of Latin American educators and scholars to holistic thinking through annual conferences and a Masters degree program in holistic education. His enthusiasm and intellectual leadership have led to the formation of an active network of holistic educators across Mexico and other Spanish speaking countries, and we are very pleased to make this new, superb English translation of his writing available in the U.S.
Dr. Gallegos spells out, with unusual clarity and focused passion, how holistic education differs from conventional schooling in modern “mechanistic” cultures. He artfully describes the spiritual, scientific, and philosophical principles that gave rise to the holistic model and explains how these are relevant to educational practice. “A major revolution in knowledge is bringing about a global cultural change,” he explains. “Based on recent scientific evidence, new views are developing on the nature of the universe, the planet, and human beings, which are replacing the positivist paradigm of mechanical science. Over the past ten years, a holistic vision of our realities has been taking shape in the fields of ecology, biology, and physics.” This vision complements, rather than denies, insights gained over the centuries through meditative practices and contemplative traditions. A holistic worldview embraces the wholeness of our humanity, and integrates, rather than isolates, our diverse human possibilities. Holistic Education addresses the tension and confusion that many of us are experiencing during this period of historical transition to a new worldview. Educators are seeing the need to bring a spiritual dimension to their teaching, yet they apparently cannot do so in public sthools without violating basic Constitutional principles. Dr. Gallegos cogently explains how holistic thinking resolves this dilemma: Spirituality is not religious dogmatism, and secular education needs to be freed from scientific dogmatism. “In scientism any non-scientific knowledge is rejected as false or inappropriate in an educational setting. So, when a child asks ‘Who am I?’ or ‘What is death?’ the false secularism or scientism disregards the questions due to their lack of academic or scientific context. The child who asked the question is considered to have made a mistake.” Yet these are the most essential questions of a young person s life, and if education is to prepare our children for lives of purpose, responsibility and compassion in a complex and challenging world, we must honor their yearning to make meaning of their lives. 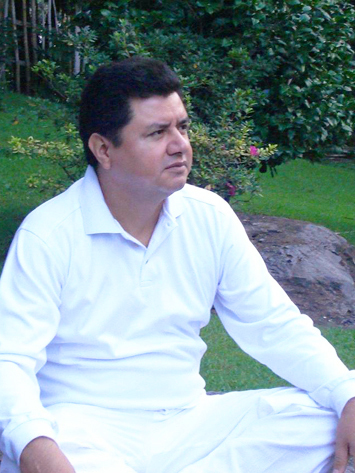 The International Foundation for Holistic Education was founded in 1992 by Dr. Ramon Gallegos Nava in Guadalajara, Mexico, to spread holistic education in Mexico and Latin America as a response to a current crisis in environmental degradation due to a mechanicist education which has trained human beings to have a predatory consciousness. The Fundacion seeks the emergence of a new planetary consciousness through a new educational paradigm of wholeness and nature, that allows us to teach human beings to live together in a responsible way in sustainable communities. To overcome predatory consciousness based on greed, materialism, and self-centeredness, the Foundation believes that it is important to know our true nature as human beings. The core of holistic education is our genuine spirituality – understanding this in a non-dogmatic way. Spirituality is our true nature which leads us to have a sentiment of gratitude for life and reverence for our planet in which we live. Holistic education is a pedagogy of universal love towards all beings.The International Foundation for Holistic Education organises an annual international conference on Holistic Education in Mexico. He is a doctor in education, international Award “Book of the year 2001”, National Award “ANUIES 1996”. Founder of the International Foundation for Holistic Education. Worldwide recognized as an eminent holistic educator and perennial philosopher. Pioneer and creator of the new holistic education paradigm. Dr. Gallegos has published fourteen books such as: “Holistic Education”, and “The spirit of education”. His extraordinary holistic vision has introduced thousands of educators and professionals to a new consciousness that honors the life in the Earth. These dimensions of thinking and expression could be mapped against literacies or intelligences of the whole person from other models. The point is that in this model holistic education attempts to consider the full range of thinking, learning and expression of the whole person. Cognitive: Thought processes, the capacity to reason logically. Social: All learning happens in a social context of shared meaning. Emotional: All learning is accompanied by an emotional state which can greatly affect the learning outcome. Corporal or Physical: All learning occurs in a physical body. Mind-body harmony is an important element in the quality of learning. Aesthetic: Beauty is a key aspect of human existence. Artistic expression of inner life is key to a happy life. Spiritual: The total and direct experience of universal love that establishes a sense of compassion, fraternity and peace towards all beings. According to Dr Ramon Gallegos Nava:In a multilevel vision of education we begin to integrate different pedagogies into a global map. This allows us to see with clarity the fact that education has at least five levels and that these rest in a deep level of awareness and experience that is kosmic or spiritual and which is fundamental to all genuine education. The spiritual level is inclusive of the individual, community, social and environmental levels, but the spiritual level itself is not included in the four lower levels of awareness and experience. For this reason the holistic educator always keeps the spiritual level in mind when working at any other level. This allows one to have a panoramic integral vision of education that is inclusive of many complementary pedagogies. Conventional education does not have this multilevel vision. Its vision is of a flat territory of a single level in which many alternative pedagogies can be seen as antagonistic towards one another because there is no inclusive vision. Almost all pedagogical theory is focused at the levels of the individual, the community and the society. The other two levels of awareness and experience corresponding to the planet and they have little presence in educational literature. Only recently has the planetary level received much attention through ecoliteracy and environmental education and only recently has the kosmic level of spirituality in education become the heart of study for holistic educators who have begun to reconstruct the educational kosmos. When looking at any lower level with respect to an upper level it is necessary to remember that we are speaking of an expansion of awareness and experience. One is not to discard pedagogy in the lower levels but to locate each pedagogy in its appropriate place. Often different pedagogical theories or theories of learning focus on only one or two levels. Those theories that are focused on the first level generate a serious educational reductionism. That is to say, they reduce the five levels to a single one losing an integral vision. Critical pedagogical thought is centered mainly at the social level as it attempts to understand ideological and cultural problems but it is inadequate to explain planetary, global and environmental problems, and completely inadequate to understand the kosmic level of spirituality. When critical pedagogy at the social level wants to judge the validity of spiritual experience it commits a serious category error since these are different levels of awareness and experience. A multidimensional vision allows us to begin to integrate components at each level and to extend a unidimensional view of education and therefore extend education beyond the mechanist or conventional. Of the six educative dimensions the cognitive has generally been a primary focus to the degree that all learning is basically considered to be a cognitive process and the educational task almost exclusively an academic development of 1ogic/mathematical abilities. This exclusively unidimensional cognitive view has its origin in the philosophy of modernity and its corresponding scientific-industrialist culture where reason is the faculty par excellence in the human being. This emphasises factory and scientific views of the human capacity to understand the world and has led to the design of conventional educational systems that have implied, conscious or unconsciously, that the student is like a robot that must assimilate information. An exclusively cognitive vision of learning is reductionistic and ignores fundamental dimensions that to a large extent determine the quality of the educative process. Education and learning cannot be reduced to purely cognitive processes because the human being much more than a cognitive process – much more than an instrument of rationality. Education cannot be reduced to academic memorizing and intellectual, rational, linguistic, linear and materialistic training. Education is a much greater experience than all that – it is related to the total awareness and experience of the child or the student. When in a multidimensional vision we include the emotional, social, aesthetic, physical and spiritual we obtain a more integral understanding of learning. Already Daniel Goleman has indicated the importance of the emotional dimension in education emphasizing that it is a better indicator of success in life than academic abilities, and Herbert Read has demonstrated the centrality of the aesthetic dimension in all educative processes, especially in children. We need to locate and to limit each pedagogy or theory of learning in its correct place in this multidimensional vision. For example, Piaget was a great investigator of the developmental stages of intelligence, but his work does not have to be interpreted across all dimensions since his study was limited to the cognitive dimension of learning and his concept of intelligence was basically in the logical-mathematical area. If we now integrate the five levels of awareness and with the six dimensions of thinking we have an integral model of kosmic education, where each level includes the six dimensions already described, generating an holarchic map with thirty educational regions that go from the individual-physical to the kosmic-spiritual. The model serves a practical purpose providing a global understanding of different pedagogies which are harmoniously related in a coherent image that allows us to observe the education territory and to act intelligently on it. This model is important in showing holistic education as an integral concept but it should not be seen as a definitive model of holistic education – just a point to begin. The model honours diversity within the unity across the plurality of levels and dimensions and gives a more integral image of holistic education. Any education that does not contemplate all five levels of awareness and experience is necessarily reductionistic and cannot be seen as integral. This happens generally when spirituality is rejected – usually with the argument that it is not scientific. Holistic education opens up crucial dimensions in learning. When learning is seen in a new extended epistemological framework where science and spirituality are compatible, no longer contradictory, science acquires human sensitivity and consciousness becomes fundamental in the integration of the kosmos. In each one of the thirty regions in the map there is an educator or thinker to give an example of that region. This does not mean that they are limited to that region but only that this is their main area of work. It was basically the point from which they saw education. All these educators or thinkers generally explored two or three regions and some others more, but in most cases moved horizontally and downwards – the majority were not aware of levels above them and their greater complexity and integrity. It is impossible in a single map to include all relevant educators and thinkers. Each region has a single educator or thinker selected to represent this point on the map. Some of these representatives are not considered to be educators in the conventional sense but they have been included if enough of their work is related to education. In this map of the integral model we can see the contribution and the limitation of each thinker, which gives us the possibility of integrating them, using the principles of the holistic education and the eye of the spirit, to see the depth or superficiality of each educator. At the first level of individual awareness and experience we have examples of the physical dimension of thinking and expression with the North American psychologist Skinner, who limits himself to an objective and materialistic view of the human being. This basic view creates a superficial understanding of learning, but even this is considered in holistic education as long as it is seen in an holistic context. Considered at its appropriate level and dimension the work of Skinner has its place. Emotional, aesthetic, social, cognitive and spiritual dimensions of this individual or personal level can be illustrated with the work of Erik Erikson, Jean Piaget, Carl Rogers, Herbert Read and Maria Montessori. These thinkers complement each other when we locate them in this extended model of holistic education. Level 2, corresponding to communal learning and community education, can be exemplified in its six dimensions with Jacobo Russeau for the corporal or natural dimension, John Dewey for the social dimension, Celestin Freinet for the cognitive, Abraham Maslow for the emotional, Howard Gardner for the aesthetic and Sam Keen for the spiritual dimension. It is necessary to clarify at this point that we are not evaluating their depth or superficiality, their errors or successes, but only their place in the Kosmic holistic education map. The next level of awareness and experience, level 3, is social awareness that has been described by social educators and the sociology of the education or critical pedagogy. In this third level we can illustrate the six corresponding dimensions with the work of David Orr for the physical or ecological dimension, Paulo Freire for the social dimension, Vygotsky for the cognitive dimension, Daniel Goleman for the emotional dimension, Rudolf Steiner for the aesthetic dimension and Fritjof Capra for the spiritual dimension. With exception of Freire and Vygotsky the other four had a clear vision of the importance of all six dimensions. For this reason their locations are partly interchangeable – Orr, Kaufman, Steiner and Capra are in fact pre-empting holistic education. Level 4, corresponding to the planetary level of awareness and experience, is the area of environmental education – whose basic premise is to educate to a think globally and act locally. Learning at this level has generally been absent in education systems because in the past environmental and global problems did not hit societies has hard as they do today. Although environmental education began in the 70s at this early stage it wasn’t very successful because it was dominated by a political-popularist vision which was based on the principles of mechanist science of the 17th century. As we enter the 21st century a new vision is arising in environmental education that is more holistic. The authors of this second phase are used to illustrate the six dimensions of this level. We will continue to use the concept of environmental education in spite of its failures but also use the concept of planetary education which is similar. The central point at this level is the understanding that the global processes of the planet are understood as a Holon. In order to illustrate the dimensions at this level we refer to the work of James Lovelock for the physical dimension, Peter Russell for the social dimension, Edward T. Clark for the cognitive dimension, Joana Macy for the emotional dimension, Buckminster Fuller for the aesthetic dimension and Juan Amos Comenio for the spiritual dimension. Finally the 5th level of kosmic awareness and experience is taken care of by spiritual education – the heart of holistic education. This level has been excluded from education as much by scientific dogmatism as by religion. That is to say scientism and fundamentalism – both poisons that kill all genuine education. With the emergence of holistic education this spiritual level acquires a crucial centrality for education of the 21st century. This is the level where holistic educators stop to contemplate and investigate kosmic education because it is the only level that allows one to have a wide vision of an integral education. From this level the holistic educator can think about and explore the 30 regions without risking reductionism or category errors. From the spiritual we can educate with clarity, order and intelligence because it is the area of love and wisdom, where we recognize the essence of who we are: spiritual beings. The sixth dimensions of this last level is represented by David Bohm for the physical dimension, David Purpel for the social dimension, Ken Wilber for the cognitive dimension, the Dalai Lama for the emotional dimension, Jeffrey Kane for the aesthetic dimension and Ron and Jack Miller for the spiritual dimension. In reality the position of these seven thinkers is to a large extent interchangeable since all have a vision that includes all the dimensions and levels. However I have allowed for very subtle differences among them to locate them in the different dimensions as a illustration that serves this model. Of the the thirty educative regions formed by this holistic education map, conventional education in the last century only has considered the individual, community and social levels of awareness and experience and the physical, social and cognitive dimensions of thinking and expression – reducing all education to just 9 regions and ignoring the remaining 21. Thus conventional education is reductionistic and incomplete only taking into account the superficial aspects of what it means to be fully human. A genuine integral education will take into account all 30 educative regions from individual awareness to spiritual awareness, from the physical to the spiritual, including the social, emotional, cognitive and aesthetic. Thehe Mexican constitution it says ‘integral education’, this is in fact a call to develop and implement holistic education with an integral vision for our children and youth of love and wisdom, of peace and fraternity.